The last year or so of movies has prompted my friend and fellow Movie Guy Adam Witt to offer up this about the onslaught of sequels we’ve seen – “give us the same, but different.” Blair Witch certainly does that as it extends 1999’s The Blair Witch Project into a franchise. What’s most different? Well…it’s louder. The 1999 original was a indie film phenomenon that just can’t be duplicated. Mostly because it launched the found footage horror genre, so that will never seem fresh again, and also because the speed and transparency at which culture flies at you now won’t allow for the duping that The Blair Witch Project pulled off, making the audience think the film was actually found footage, and not a movie. But where The Blair Witch Project looked like a compilation of found footage you’re just stumbling across, Blair Witch feels like a compilation of found footage put together (by some sick bastards) to make a horror movie. 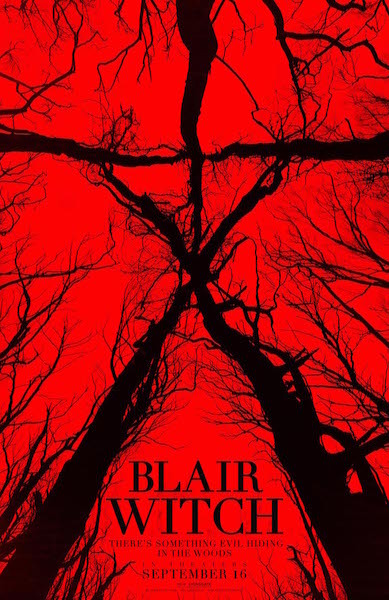 The story involves James, who believes his sister Heather (the protaganist from the original film) is still alive in The Black Hills Forest in Maryland, that she somehow survived her encounter with The Blair Witch. He gathers a group of friends (and two strangers who supposedly previously found said found footage) to venture back into the woods to learn if there’s any hope in finding Heather alive. The conceit is that James’ friend Lisa is going to document the whole trip, so the team outfits themselves with body cameras, handhelds and even a drone copter. Quickly the footage seems less found than “put together” by someone to make it scary, including the dense sound effects that there’s no way the consumer cameras are going to capture at such decibals (and, again, who would do that? And who would go back into the woods AGAIN to get this footage, especially when it’s revealed the dangerous places this footage ends up? And some footage is still in the cameras on characters who are dragged into the night, never to be seen again, except, apparently, by the people looking to find their footage). Of course, that’s all fine-tuned observation of the overall design of the movie. You could even argue that’s cynical analysis. The point that will resonate with audiences or not is…is it scary? If you haven’t seen any of the previous movies (or most horror movies), yes. But it treads an interesting line in that it often follows a wildly familiar path, hitting points that are rather mainstream (and somewhat verbatim from the first film) for a kids-lost-in-the-woods movie. Then, strangely, completely random things happen, like time displacement and creatures (or something) living underneath the skin. Going with a lot of “or something” is a shame when the Blair Witch legend lends itself to more direct complications. It’s mostly acted and shot competently (this will be a bump on Adam Wingard’s road of otherwise unique horror films). One scene that will be talked about by everyone who sees the movie is when Lisa finds herself in an underground tunnel that gets smaller and smaller, squeezing her tighter as she crawls forward, with minimal light. It’s a creepy, claustrophobic scene. More of that, please. Check out more from The Movie Guys on their website! Follow The Movie Guys on twitter, here! Devoted to the movies, with a unique comedy take only The Movie Guys can provide.